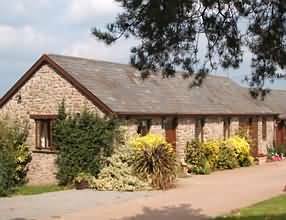 Usk accommodation in friendly Usk hotels, B&B, Bed and Breakfast, homely Guest Houses, cosy Holiday Cottages, congenial Country Pubs and Inns, luxurious Usk Country House Hotels and Caravan and Camping sites. Two Luxurious 17th Century stone cottages of great charm and character, they have panoramic views of beautiful countryside of the vale of Usk, and being only 8 miles from the old historical market towns, of Monmouth and Abergavenny, the scenic town of Ross on Wye, is only a short drive away. Both cottages provide all the comfort and convenience while retaining the charm and originality of a traditional country cottage whilst retaining many historical features of the original Cyder Mill and Stables. Sleeps 4 - 2 bedrooms: Very spacious lounge/dining area, Sky Sports television, oil central heating and fully fitted kitchen. 1 Twin Bedroom, 1 Double Bedroom, Bathroom with bath, shower, basin & W.C. Secure off road car parking, private garden and furniture. 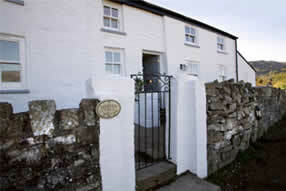 Sleeps 4 - 2 bedrooms: Very comfortable lounge/dining area with oil central heating and fully fitted kitchen. 1 Twin Bedroom, 1 Double Bedroom, Bathroom with shower, basin & W.C. Secure off road car parking, private garden and furniture. It commands a superb position with outstanding views over Crickhowell, across to Table Mountain and the Sugar Loaf. Set just inside the Brecon Beacons National Park the area is well known to walkers, cyclists, bird watchers and cavers. 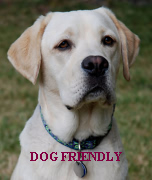 So if you are looking for an activity based holiday or somewhere to just get away Mayberry is the perfect accommodation. The cottage is typified by traditional flagstone floors, oak beams and a crackling open fire but with underfloor heating to make any winter snug. For a traditional cottage the accommodation is reasonably generous with 4 bedrooms and 2 bathrooms as well as a downstairs WC. It sleeps 8 (+1). Rear double ensuite – a charming room with patio doors onto the rear patio and fantastic views up the mountain and the escarpment in the North, topped off with a beautifully equipped en suite bathroom. Master double/twin bedroom – a large bedroom with the signature oak beams with views up to the escarpment in the north elevation and to the front, down the valley to Crickhowell and Table Mountain . (Additional put me up bed is available to sleep additional person if required). The Old Master bedroom (double) – probably the most charming room in the house. The oldest bedroom with the original spiral stone staircase (as well as separate access) with exposed stone and beams and again lots of views up the mountain and down the valley.